The fuel injector cleaning steps follow by Injector Rx allows for the inspection of all operational aspects of the fuel injectors. Injectors are ohm tested for resistance. If they fail this test no further attempt will be made to clean them. Then they are externally cleaned, visually inspected, and numbered. tested for inductance, shorts, and current draw. Now spray pattern, and flow rate tests are performed and recorded. Dirt, loose paint and rust is removed via a parts cleaner and or blasting process. Filter baskets, O-rings, and pintle caps are removed if needed or where applicable . A three step ultrasonic cleaning process is performed. During this processes the injectors are pulsed at various rates. This ensures complete results. Only biodegradable environmental friendly chemicals are used . After ultrasonic cleansing a high pressure back-flush is performed to remove any remaining particles that might be left inside the injector and to flush out water based ultrasonic cleaning fluids. 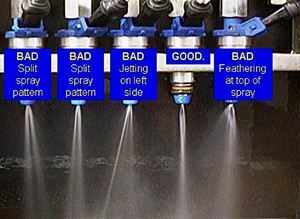 The injectors, fuel or air, are now retested for: leaks, spray pattern and flow, and the results are recorded. New filter baskets, O-rings, and pintle caps are installed if and where applicable. The injectors are lubricated and placed in sealed plastic bags. A comprehensive test report is prepared and returned with the injectors. Injectors are flow tested only. No additional service is performed and no components are replaced. Flow test results are recorded. Upon completion of the the flow test the injectors are lubricated and sealed in Poly bags. The injectors are lubricated with special lubricant. The injectors are sealed in Poly bags. Although there is many fuel injector cleaning methods, our cleaning steps and fuel injector flow testing procedures and equipment are approved by major fuel injector manufacturers. Please allow us the opportunity to earn your business. We have been servicing fuel injectors for customer nation wide since 2006. We also offer a same day or while you wait fuel injector cleaning service at $25.00 per MPI Injector or $35.00 per Direct Injector. For this service we do have a $60.00 minimum charge.